How do you physically experience art? 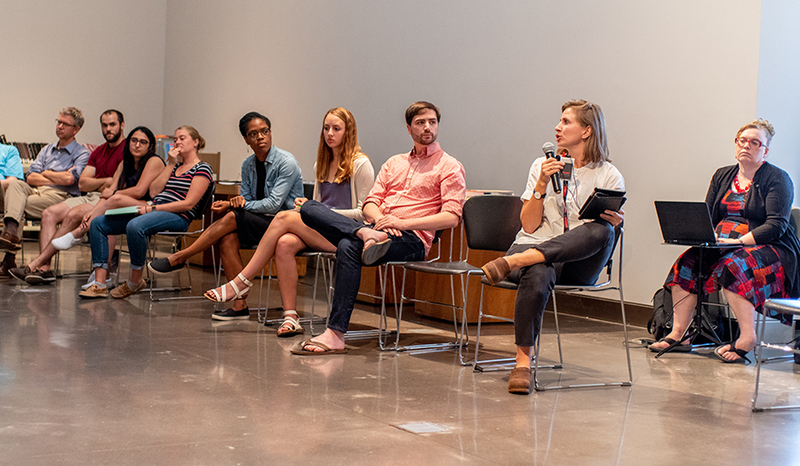 Liza Sylvestre organized a recent walking tour and group discussion at the Weisman Art Museum around visual art, inclusion, and accessibility. I recently had the pleasure of attending the Sensory Loss and Art Symposium, a gathering of about fifty people either living with or studying hearing and vision loss, organized by artist Liza Sylvestre. We met at the Weisman Art Museum and divided up into six tour groups with the stated intention of reflecting on the concept of Accessibility. We were supplied with prompts leading us to individual works of art in the museum, where we would discuss both the artworks and the barriers to engaging with the pieces for those with sensory disabilities. My group of eight included Gordon, who has very limited vision, and Marian, who is deaf and could communicate only through American Sign Language. 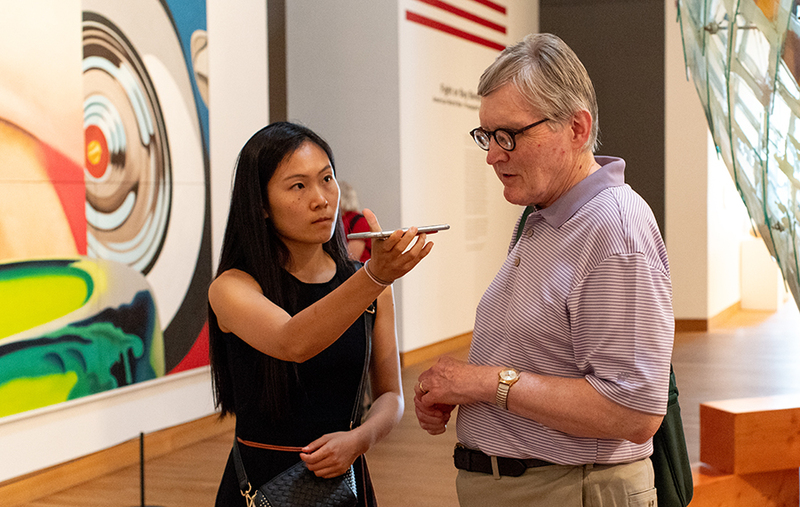 Other participants included Gordon’s assistant, a researcher who uses MRIs to study vision cognition, a Weisman curator, and our tour guide, a scientist working to make interactive hearing aid apps more user-friendly. Gordon proved to be the most vocal and engaged of the bunch, describing the vague colors and shapes he could make out of each piece (he particularly enjoyed James Rosenquist’s gigantic World’s Fair Mural), but Marian had a much harder time communicating. Despite being able to see all of the artwork just as well as the rest of us without vision impairment, she was nevertheless relegated to a passive observer without the benefit of a sign language interpreter. Our group worked to include her by speaking into a transcription app and allowing her to read what we were saying, but she was effectively muted from the conversation, an unfortunate circumstance that plainly illustrated the whole point of the event: to recognize barriers to access and to work together to overcome them. Participants using a speech-to-text app to facilitate communication. Photo by Boris Oicherman. After an hour or so discussing different artworks, including an untitled Sol LeWitt— no small feat for any group of strangers without advanced art history degrees — everyone gathered in a large room filled with Daniel McCarthy Clifford’s installation Section of Disapproved Books, a collection of books banned from American prisons. Our task was to “make the space accessible,” an exercise in democratic problem-solving that left many people simply milling about, mingling with one another. Our group, with the help of a newly arrived sign language interpreter, discussed whether accessibility was tied to the functionality of the space; no answer was obvious. Eventually some enterprising folks pushed all of the library carts against the wall and began forming the stacked chairs into a giant, amorphous circle. Everyone settled into a seat and a group discussion began (aided by hearing devices and a microphone). Sylvestre started it off with the question I had asked her when we first entered the room: what does accessibility mean in this context? 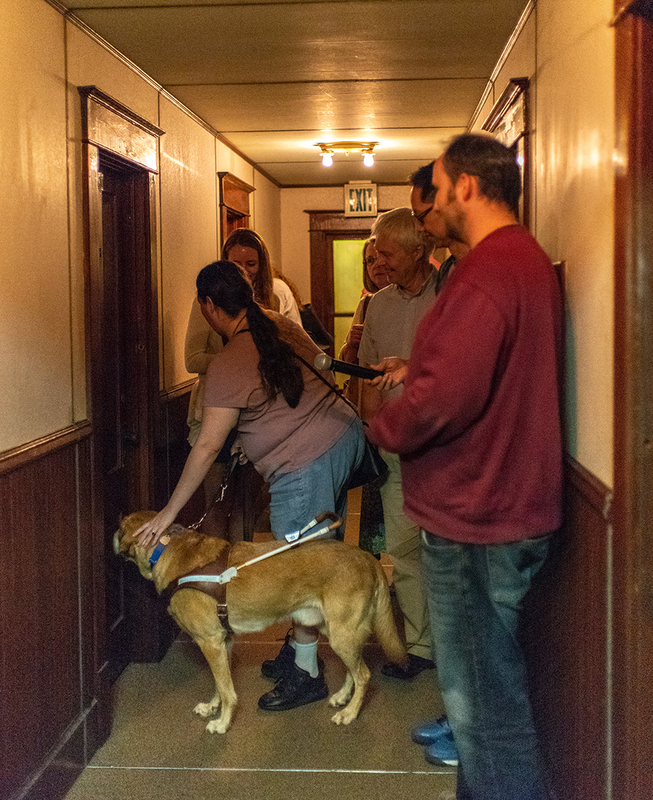 One participant, sitting with her seeing eye dog, answered quite simply: “Accessibility is anything that allows me to be included.” Another participant, who was using a hearing device, began choking up when she explained how much it meant to be part of a truly accessible conversation. The group discussing their experiences on the tours and about disability in general. Photo by Boris Oicherman. The Symposium ultimately raised more questions than it answered (by design, I think), so I followed up with Sylvestre, whose hearing loss has figured prominently in her own artwork, to see what she got from the experience. Russ White: Can you tell me about the Symposium, how it came to be, and what you hoped participants would get from it? 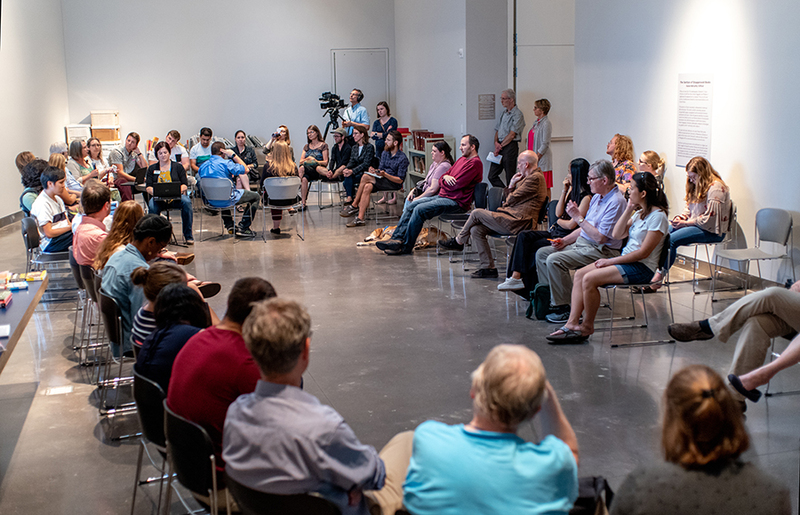 Liza Sylvestre: The Sensory Loss and Art Symposium was the end result of a summer-long residency with the Center for Applied Translational Sensory Science (CATSS) at the University of Minnesota. All summer long I met with scientists studying all facets of vision and hearing loss, and learned about their individual research interests. It became clear very early on in this process that, although these scientists study sensory loss, only three of them (which, in a demographic of scientists, is actually quite a high number) have sensory loss themselves. These are brilliant people whom I deeply respect, but I saw a big gap between their research decisions and the everyday knowledge that arises out of actually living with sensory loss — an aspect that shapes all interactions between the individual and the world. I wanted to create something that directly addressed this gap, something that would put these scientists in close proximity to individuals who do posses the knowledge of living with sensory loss. I was also excited about bringing a “scientific conversation” into an art institution like the Weisman. 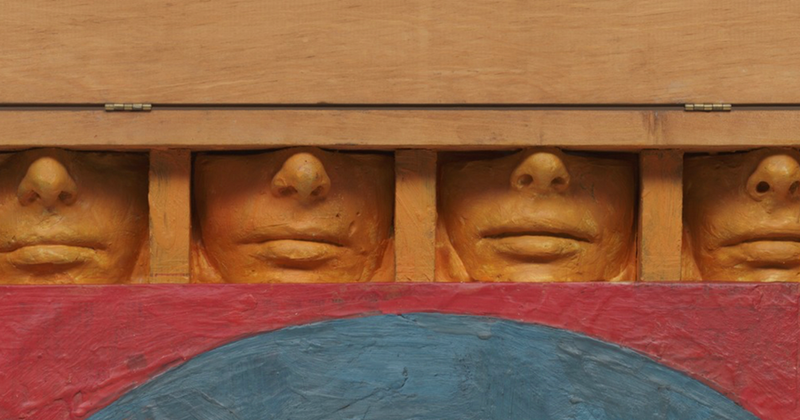 We use our senses to engage with art, and we do so without really questioning how or why. Museums play a huge role in creating these “normative rules” that pave the avenues we use to engage with art. It felt important, and connected, and complicated, to have this conversation with these scientists in the space of a museum — sort of pointing out everyone’s shortcomings. 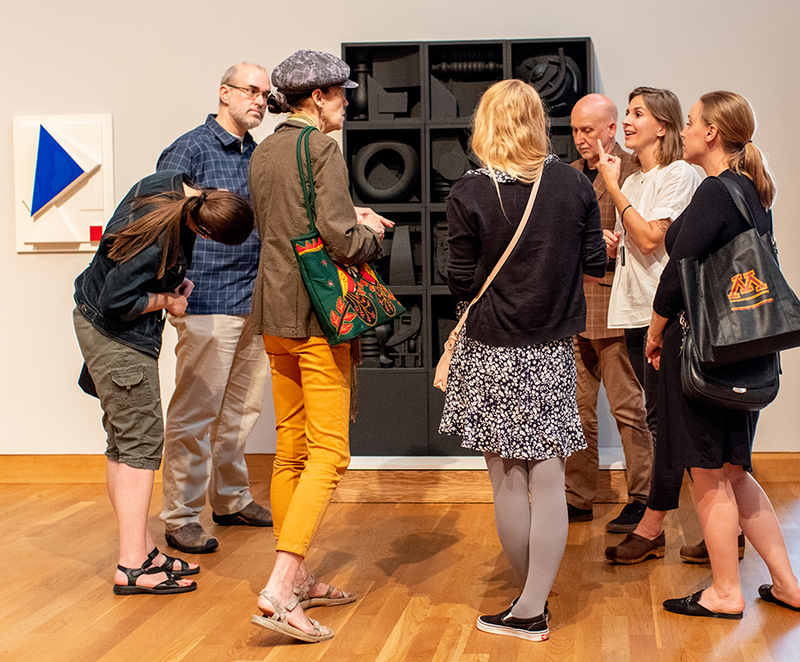 Sylvestre (second from right) engaging one of the tour groups in front of a sculpture by Louise Nevelson. Photo by Boris Oicherman. RW: Most of the participants seemed to have a background in science, not art. How and what do you think these different disciplines can learn from each other? LS: This is something I’m still wondering about and learning about. Working with scientists all summer made me deeply question the differences between the two disciplines. I witnessed so many incredible parallels between the art studio and the science lab, between the formation of questions, and the presence of larger philosophical thought. As an artist whose studio practice has evolved from one of painting and drawing to a conceptual practice, research has become a huge part of my work, and some of that research is science research. The scientists with whom I felt most connected this summer are creative thinkers whose approach to science is maybe less traditional and more “outside the box.” These are the sorts of artists I also connect with. My big take away from this experience is that as a human species we’ve gotten too good at categorization and specialization. We think of our senses as separate entities, we think of our fields of research as separate, we think of our genders and cultures as separate, too. But the truth is much more complex than we want to admit — nothing exists in isolation. Every single thing is a multi-sensory experience; science and art overlap, just like so many other things. We all benefit from diversity, whether that is diversity of backgrounds, diversity of knowledge, diversity of culture, or diversity of sensory make-up. We all need to consider other ways of being more often than we currently do. LS: Language is powerful. It’s akin to the authority of a museum guiding our experiences in one direction and not another. Terms like “Deaf” or “hard of hearing” imply more about cultural identity than the term “hearing impaired,” which is simply a medical condition. If you are a culturally Deaf person you do not feel you have a medical condition that needs fixing, you have a cultural identity. This can also reluctantly be said for hard of hearing individuals like myself, but those of us “in between” are sometimes less easily able to identify the culture we belong to. I’m not culturally a hearing person because I am excluded from the design of the hearing world, and I am not a Deaf person because I didn’t grow up with American Sign Language and the culture that accompanies it. I am largely displaced. Culture, or “belonging”, is something I think almost any person with a disability has sought and seldom found. “Normal” doesn’t exist, but ideals of normal exist and are constantly enforced in the design of the world. Art is not currently being made for blind people, social environments are not currently being designed for Deaf or hard of hearing people, and public spaces are not often considering “non-normative” individuals in their conception. What we are given is a normative model and then accessibility programming. But the problem with accessibility programming is that is still asks us disabled folks to do the work to get to the normative ideals. I completely shun the concept of accessibility programming. I completely shun the concept of normal. I want the fundamental design of things, from conception, to be centralized around a diversity of experiences and bodies and cultures. I want museums designed for all sorts of disabled people, I want artists and curators to be considering these experiences in the histories we write. I want “normal,” as a concept, to retire. I want to be able to go to a movie or a play any night of the week, not on the specific day and time that has captioning. Accessibility programming is a sort of erasure. It’s divisive, and even though it has good intentions, it is not the answer. A tour group experiencing Pedicord Apts by Ed and Nancy Reddin Keinholz. The installation features audio elements that participants described to those with hearing loss. Photo by Boris Oicherman. RW: Disability Studies, sometimes called Crip Theory, is a growing field in Art History, relating concepts of physical disability, materiality, and accessibility to museums and artworks, both literally — in terms of wheelchair ramps, hearing aides, and tactile supplements to visual work — and figuratively, in terms of more representation of disability in artwork and different approaches to art conservation. Do you keep up with this field of study? Where do you think art museums can do better, and where do you think they’ve made good progress? LS: Yes! Crip Theory is a new evolution in disability and gender studies that considers disability, race, and gender in society at both local and global scales. I profoundly identify with its concepts and goals. I think the biggest problem we face in making progress toward an entirely inclusive society is assuming that accessibility programming is enough. It’s not. We are so far behind that we are impressed when a museum offers audio descriptions of artwork so that blind people can “experience” the work. Sure, this is great, but we could do so much better. We could make actual artwork for people who are blind instead of asking them to experience something that was not originally intended for them. The Minneapolis Institute of Arts has something like 40 works of art that can be touched on a blind accessibility tour, but how many works of art do they have in their collection? Institutions of all kinds bring in accessibility programming and then feel they’ve met the ADA compliance, and that’s the end of the story. I dream of much bigger changes. I demand a world that doesn’t ask Deaf people to show up at a certain time for a certain tour on a certain day of the month. I ask that we make fundamental changes in design so that there is no need for accessibility programming. Sylvestre facilitating discussion, with the help of a microphone and hearing devices. Photo by Boris Oicherman. RW: What was your biggest take-away from this Symposium, and what do you hope to investigate further with future events? LS: There is so much work to do! I am grateful for the support of Boris Oicherman, the curator I am working with at the Weisman. I am grateful for Peggy Nelson and Gordon Legge and all of the PhD students and post doc scientists who were so generous with their time in the formation of the Sensory Loss Symposium. I’m grateful for the individuals at the Mia and the Bell Museum who met with me this summer and talked to me about their accessibility programs. I’m grateful to the individuals with sensory loss who participated in the symposium and who made themselves vulnerable by vocalizing their experiences and allowed their exclusion to be witnessed. All of these relationships feel interlaced and important in the progress I want to make. This symposium was just the very, very beginning. I’ll be taking this work up again through a year long residency between the Weisman and CATSS next Fall 2019, once I’ve completed my MFA program. As an artist, and as an individual with a disability, I plan to infiltrate the Weisman and change how the public interacts with the artworks in it. And even after I’ve done this, it will just be another beginning, with a whole lot of work ahead. Liza Sylvestre is currently pursuing her MFA at the University of IL Urbana-Champaign. To learn more, visit lizasylvestre.com.